When a strong-willed yet dutiful woman sees her unassuming husband getting pulled down at each step in life, be it at home or at his workplace, she decides it’s time to make him stand for himself, become self-reliant and pursue his dream of becoming an entrepreneur, while she stands beside him as a rock, guiding him every step of the way. Nowadays, if anyone does anything out of the ordinary, he or she instantly becomes an internet buzz and memes are the new addition to the internet family. As soon as director Sharat Katariya released the promos of his ‘Sui Dhaaga: Made In India’, a particular scene from the movie stuck with the audiences and Anushka Sharma quickly became a meme. That gave Katariya’s movie an edge and people got interested in the film’s plotline. Starring Anushka Sharma and Varun Dhawan in the lead, ‘Sui Dhaaga’ is a simple story with its heart in the right place. 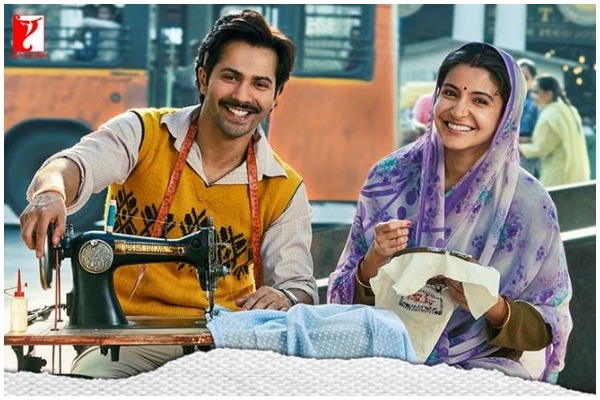 Set in a small town of Chanderi in Madhya Pradesh, Mauji (Varun Dhawan) is in a loveless marriage with his wife Mamta (Anushka Sharma) for a while. They lack the chemistry apparent between young couples and surprisingly enough, haven’t had the chance to explore their relationship further. Mauji works as a seller at a sewing machine shop and doesn’t expect much from life despite his bosses – The Bansals – putting him down at each step. Although his wife keeps up with his humiliation, she thinks there is a limit to it. At home, his frustrated father (Raghubir Yadav) spares no chance to humiliate him further, and an ill mother, who has nothing but orders for her bahu, who willingly does what is expected of her. However, Mauji doesn’t come out of the daily grind, which rankles his wife no end. When Mamta, who is adept at embroidery, urges him to come up with a tailoring business of his own, Mauji realizes it’s time to give up his faltering ways and prove his worth. You don’t come across a movie like ‘Sui Dhaaga’ everyday and ‘Dum Laga Ke Haisha’ director makes sure you take interest in the story that is unfolding on the screen this time too. Written with believable characters in mind, Katariya brings a realistic story forward, projecting life in a small Indian town perfectly. Of course, he does take some cinematic liberties at places, but he makes sure he doesn’t disturb the pace of the film in the process. The story is authentic and sets the tone of the film right from the word go. Varun Dhawan and Anushka Sharma get out of their comfort zones in bringing to life two rustic characters that have never been like them in real life. And honestly, they neither go overboard with it nor do they struggle hard to portray their roles. Both the lead actors look at ease as Mauji and Mamta respectively. While Varun Dhawan, who sports a mustachioed look, does justice as a docile son and submissive employee, his transformation as the worthy entrepreneur is commendable. Anushka Sharma plays a sari-clad small townie, which made her character viral on the Internet, and truly shines as one. She plays a timid housewife, who comes into her own when situation demands her to and Sharma’s portrayal as a strong woman, masked behind an aadarsh bahu is worth a mention. Raghubir Yadav as the fretful father, who is tired of his son’s failing ways, is first-rate as always. Technically, the film is good too. The screenplay is realistic and the editing is crisp. ‘Sui Dhaaga’ could have done well without the songs, but they come on as situation demands and do not hamper the pace of the film. The cinematography blends in with the theme of the movie and makes it look even better. The first half is breezy, while the second half takes a little extra time to reach a predictable conclusion. On the whole, ‘Sui Dhaaga: Made In India’, with its true-to-life depiction of human nature and endurance during odds makes it a clear winner. Laced with humour, emotions and authenticity, ‘Sui Dhaaga’ is worth a watch.